Pablo Picasso. Crucifixion. 1930. Oil on wood. 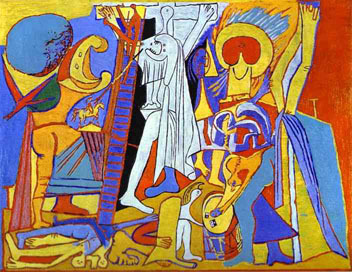 Many would consider Picasso's Crucifixion bizarre. The work is abstract and therefore difficult to decipher. However, Picasso's intent is not to insult or demean. It is simply the artist's way of expressing himself. However, what happens when art is produced to deliberately shock or demean one's religious beliefs? Does it still qualify as art? Six religiously controversial works are presented below. As a basis of comparison, their more traditional counterparts are presented next to them. 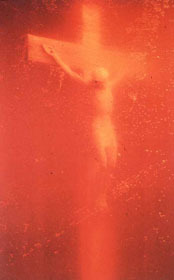 The first work is a photograph entitled, Piss Christ by Andres Serrano. The photograph depicts a crucifix immersed in a container of the artist's urine. The photograph was part of 1989 exhibition and partiallyfunded with NEA dollars (Trager 93). The exhibition sparked the ire of Christian groups and ignited debate in congress concerning the use of public funds to sponsor such controversial works. 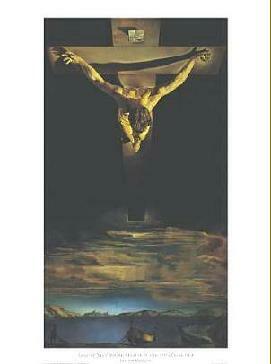 Unlike Serrano's work that degrades the crucifix, Dali's work places the crucifix in an exalted position in the heavens. The next three works were on exhibit at the Brooklyn Museum between 1999 and 2001. The controversial nature of the works resulted in political action by Mayor Rudolph Giuliani who viewedÊ the works as disgusting and anti-Catholic. Renee Cox's 2001 exhibit mimics works of the great masters, Leonardo da Vinci and Michelangelo and depicts events in the life of Christ. 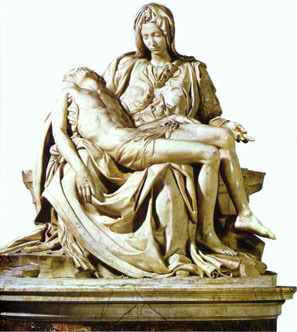 In Yo Mama's Last Supper, she stands naked in the traditional place of Christ (Cash), and again in Pieta, she stands bare chested in the place of the Virgin Mary. These works invited strong reaction from Christian groups. 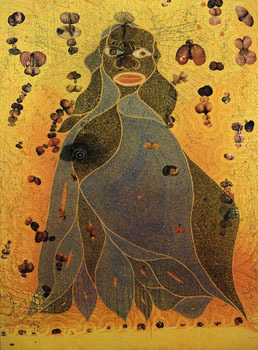 British citizen Chris Ofili displayed his works at the Brooklyn Museum in 1999. His exhibition entitled, Sensation received equally strong reactions. One work in particular, The Holy Virgin Mary sparked strong controversy in the New York area. The work featured an image of the Virgin Mary composed of paper, paint, glitter and elephant dung including small photograph cut-outs of female genitalia (Davis). Alma Lopez's work entitled, Our Lady did not receive the attention of the preceding works, however, it was similar in subject matter to the others. Lopez's work was displayed at the Museum of International Folk Art in Santa Fe in 2001. It is a computer generated image of the Virgin Mary. However, Lopez stands in the place of the Virgin wearing a flowered bikini (Cash). Like the preceding works, Lopez's work displays religious content in a less than exalted manner.